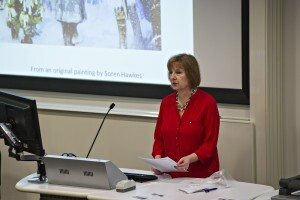 Karen Ette at the talk she gave in December 2014 on the lesser-known Christmas Truce of 2015. Loughborough Archaeological & Historical Society host a talk by Karen Ette on Leicestershire memorials to the fallen from WW1. The talk will examine memorialisation from the Western Front to the Home Front with particular reference to Leicestershire’s war dead. It will consider how Leicestershire soldiers were remembered in their home county as well as how Leicestershire regiments are represented on the large, well-known memorials of Belgium and Northern France, alongside soldiers from other regiments and participating countries. What, if anything, do these sites have in common? What influence did returning soldiers and the local populace have in their conception? 7.30 pm start. £3 for non-members, £1 students, free for members. Room D002 in the James France Building, Loughborough University.